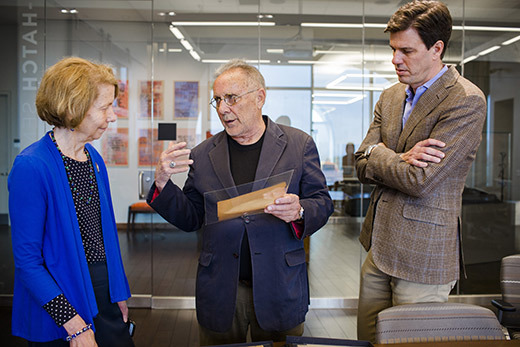 From left, Rosemary Magee, rare book collector Paul R. Kennerson and Joe Crespino look over a collection of personal correspondence and memorabilia of renowned novelist Harper Lee in the Rose Library at Emory University. Photo by Ann Watson, Emory Photo/Video. Thursday, May 3, at 4 p.m.
Joseph Crespino, author and Jimmy Carter Professor of History at Emory University, will discuss his new book, “Atticus Finch: The Biography,” at a Rosemary Magee Creativity Conversation on Thursday, May 3, at 4 p.m. in Emory’s Woodruff Library. The event is open to the public at no charge. Attendees are asked to sign up at the registration link. Copies of Crespino’s book will be available for purchase and signing at the event, five days before the book’s official May 8 release. Finch, a significant character in both books, was based on Lee’s father, an attorney. Crespino’s book draws on exclusive sources to reveal how Harper Lee’s father provided the central inspiration for each of her novels. The conversation will take place from 4-5 p.m., followed by a reception and book signing. Some of the letters and memorabilia will be on display at the reception. The event, which will take place in the Jones Room on Level 3 of the Woodruff Library, is sponsored by the Bill and Carol Fox Center for Humanistic Inquiry; Center for Creativity & Arts; Emory College of Arts & Sciences; Emory Department of History; Stuart A. Rose Manuscript, Archives, and Rare Book Library, and the Emory Libraries. The Rosemary Magee Creativity Conversations highlight creativity and imagination as essential to every discipline and enterprise. The Woodruff Library is located on the Emory campus at 540 Asbury Circle in Atlanta, 30322. Parking is available in the Fishburne deck. For disability-related accommodations, please contact Emory Libraries events manager Maya Cody in advance at 404-727-7620 or maya.cody@emory.edu. Crespino will also appear at the Carter Presidential Library & Museum for a lecture and book signing on Tuesday, May 8, at 7 p.m.